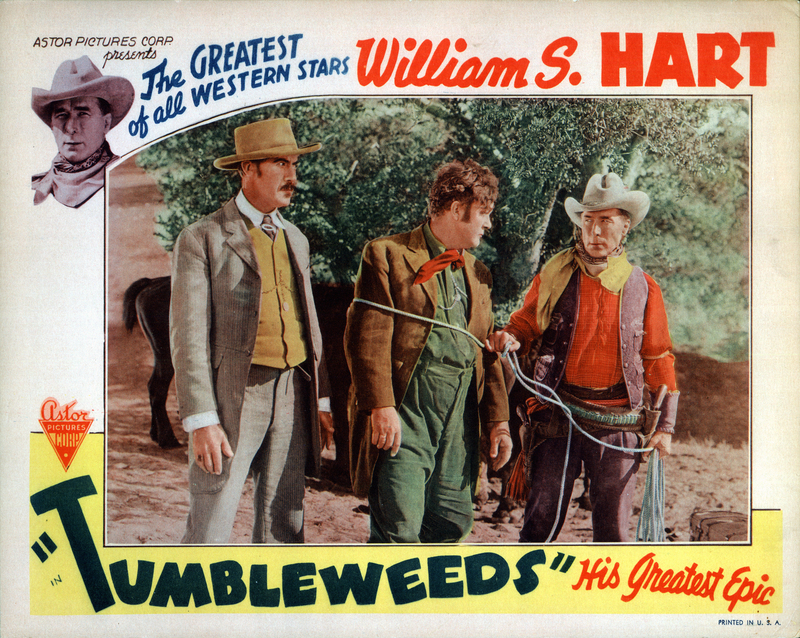 Original 11x14-inch lobby card for the 1939 Astor Pictures Corp. re-release of the 1925 feature film, "Tumbleweeds," starring William S. Hart. Card reads: "Astor Pictures Corp. presents / The Greatest of All Western Stars / William S. Hart / Tumbleweeds / His Greatest Epic." Unlike the 1925 original, the 1939 re-release had synchronized sound (the film had a sound track with music and effects; no live organist or orchestra needed); and an 8-minute speech by Bill Hart was tacked onto the front end of the movie. Hart delivers his speech outside of his hilltop home at the Horseshoe Ranch in Newhall. It is the only time he ever spoke on film. Although not for lack of desire, he would never make another movie. From Koszarski (1980:129): Produced by the William S. Hart Company; distributed by United Artists; released December 27, 1925; ©November 11, 1925; cost $312,000; seven reels (7254 feet). Reissued in 1939 by Astor Pictures with synchronized soundtrack and spoken prologue by Hart. Directed by King Baggot; Screenplay by C. Gardner Sullivan from a story by Hal G. Evarts; photographed by Joe August. CAST: William S. Hart (Don Carver); Barbara Bedford (Molly Lassiter); Lucien Littlefield ("Kentucky Rose"); Gordon Russell (Noll Lassiter); Richard R. Neill (Bill Freel); Jack Murphy (Bud Lassiter); Lillian Leighton (Mrs. Riley); Gertrude Claire (Old Woman); George Marion (Old Man); Capt. T.E. Duncan (Major of Cavalry); James Gordon (Hinman of the Box K Ranch); Fred Gamble (Hotel Proprietor); Turner Savage (Riley Boy); Monte Collins (Hicks). Don Carver was range boss of the Box K ranch. He was a hardened, cool-headed and fearless "tumbleweed," and to his mind, about the "orneriest critter" on earth was the homesteader. Riding into Caldwell, Kan., on the edge of the strip, to confirm this news, he met among other cowhands his boon companion, "Kentucky Rose," who looked upon himself as something of a prairie sheik. Journeying on the Caldwell, they see a great cloud of dust, which tells of the vanguard of the homesteaders in the greatest land rush in the history of the United States ... Don Carver and "Kentucky Rose" mingle with the homesteaders, and Don runs into the Lassiter family. He promptly falls in love with Molly, the eldest daughter, and very soon makes up his mind to stake out a homestead claim for himself — and maybe, Molly. He decides to locate on the site of the Box K ranchhouse where the water control of the land strip centers. Molly's rascally half-brother and an equally evil companion start out to circumvent Don in this plan, with the idea of themselves locating on the ranchhouse site, getting control of the water rights and selling to other homesteaders. They bring about Don's arrest as a "sooner" — one who staked a claim before the hour set by the government. Don escapes, however, in a brilliant and dramatic dash for liberty, and rides to the site where young Lassiter and his companion are already located ... Carver evicts them; and then they seek to influence Molly against Don by telling her he has "jumped" their claim, and tell her it is Don who plans to control the water shed. Government troopers then come into the scene and arrest the two as "sooners" and on an additional charge of shooting a soldier. Molly learns her mistake, and while the course of Don's wooing of the prairie flower runs by no means smoothly, she finally consents to become his wife. The epoch-making dash of the homesteaders across the great, sweeping prairie is spectacular in the last degree. Rolling across the broad acres are shown ever increasing numbers of homeseekers, until there is one vast, swiftly moving jumble of men, women, children, horses, cattle, wagons, buggies, buckboards, sulkies and prairie schooners. It is an epic and highly dramatic hour — this last dash of American homesteaders, and even the "tumbleweeds" — the cowpunchers and cattlemen — are impressed against their will by the birth of a new day and this vanishing of an old order of things. (From the Tumblesweeds Pressbook, 1925). REVIEWS: King Baggot has smoothly and finely directed this production. He has built up wonderful suspense in the scenes just preceding the firing of the gun to start the rush, which will get the spectators' nerves on edge, and has put over the stampede with a big punch ... Oh, boy, the way Hart breaks from the stockade, mounts his horse and outdistances everyone will provide thrill after thrill for all who like fine riding. Why there are scenes where his horse's feet seem to be leaping thorugh the air, barely touching the ground (C.S. Sewell, Moving Picture World, January 2, 1926). For the first time that great Western actor who set the standard for all Western stars who followed, Bill Hart, appears on the screen in closeup, and speaks. And what he says is not just an ordinary speech. ... He makes you understand and feel what the old timers felt about their Western country. But the big surprise that will come to everybody is the remarkable quality of Hart's voice. It is one of the most vibrant dramatic and emotional male voices that has ever been heard on the screen. It Hart was a younger man and came into pictures today, he would zoom to the top as one of our finest actors .. He will prove a revelation to all modern picture lovers who remember this greatest of the Western stars in the silent days (Film Daily, 5-9-1939). LW2764: 19200 dpi jpeg from original lobby card purchased 2015 by Leon Worden.